I still remember the first time. I was a college student. We were at Crepevine in Berkeley, and I probably should have gotten something off the savory menu. It was, after all, dinner time. 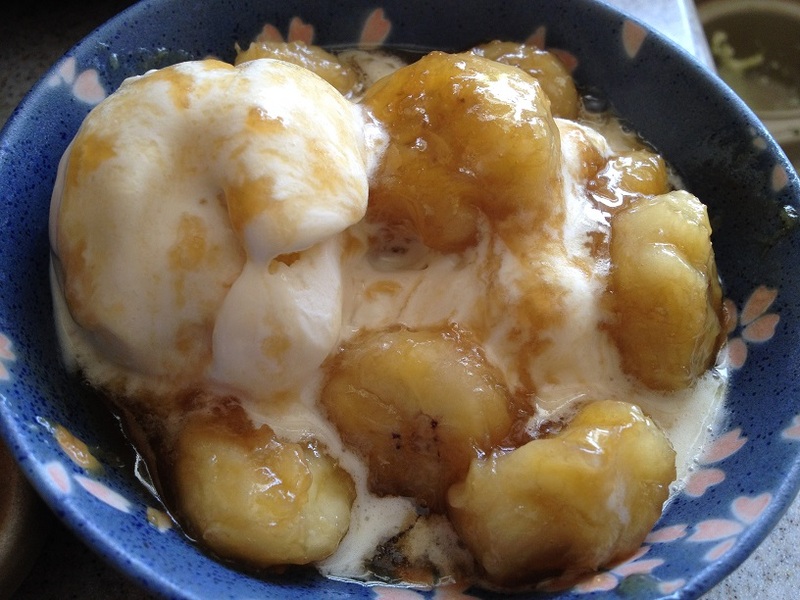 But I couldn’t resist, and instead I selected The Jamaican: Bananas in Caramel Rum Sauce. I was intrigued. Caramel? Rum? Bananas? What on earth would that taste like? Soon, I found out. It was spectacular. 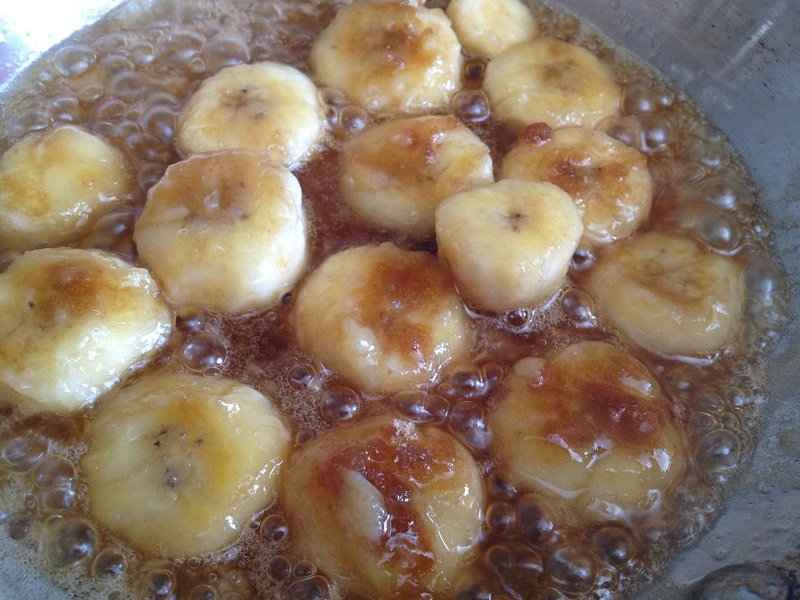 I had never really had cooked bananas before this, but cooking them in a buttery caramel sauce was definitely the way to go. I wasn’t sure if that addictive flavor was the caramelized banana, the buttery browned caramel, or maybe… the rum? It didn’t matter. When you melded them together and then topped it on smooth, vanilla bean ice cream and a touch of whipped cream, it was magic. My taste buds swooned over the new notes of delicious, and I felt like Remy in Ratatouille as he explained the beauty of food to his brother in the alleyway, fireworks and all. Mmmm. So of course, the next step was to make it. It wasn’t very hard, actually. There was obviously butter, sugar, rum, and bananas in it. I’d figure out the rest. …Turns out, that’s all it took. Four ingredients = an explosion of happy in my mouth. This is a great dessert to make any time you have a couple of extra nice ripe bananas. The measurements are very loose, and you can really use whatever spirit (is that what you call it? Whiskey… rum… those kinda things) you have on hand. Or you can skip the alcohol altogether. I haven’t noticed a huge difference either way, but it is fun to pour in a little rum and watch it catch on fire. By the way, I hear flambéing actually only removes about 25% of the alcohol, so go easy, my friend. I think this is best served atop vanilla bean ice cream. Have your spoon at the ready, though. The hot caramel melts the ice cream very quickly, and if you don’t get right to eating, you’ll have a big bowl of caramel vanilla soup, which isn’t really such a bad thing… but you lose out on the delightful contrast of temperatures and the smooth ice cream texture if it hits the soupy stage, so I’d just be prepared to eat quickly. In the future, I will spoon it into the side of the bowl to slow down the ice cream melting process. Of course it’s also wonderful in a crepe with vanilla ice cream, but that takes a few more steps to prepare, so save it for a fancier night. If you’ve never had this combination of flavors before, you definitely want to try it at least once. You won’t regret it! Heat pan to medium high. 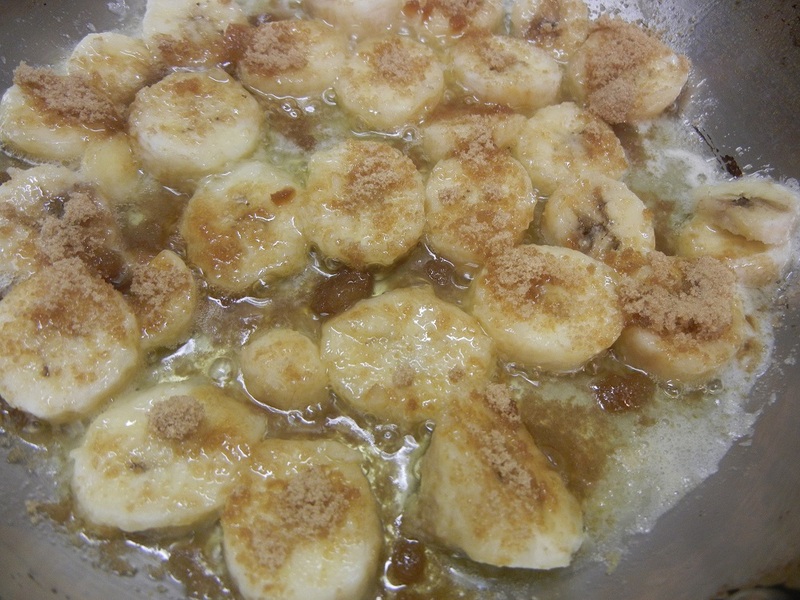 Melt butter in pan, then add sliced bananas in an even layer. If you’re not adding rum, then spoon into bowls of ice cream and serve immediately! To flambe, first turn off the flame. Drizzle in 1-2 tablespoons of rum, then put the cap on the bottle and set it aside. Turn the fire back on, and move the pan around so that it can catch a little bit of the flame from your stove top. Once it lights, you will see blue fire as some of the alcohol burns off. Once it burns off, spoon into bowls of ice cream and serve immediately! I imagine there are other fruits that would also be “fostered” nicely. I haven’t gotten there yet, though, as I’m pretty in love with the bananas and caramel combo. Hope you love it, too!